Accept Vicente Valtieri's offer to become a vampire. After the Dark Brotherhood quest The Assassinated Man, speak to Vicente Valtieri and select the topic "Dark Gift". After Vicente agrees to visit you in your sleep, find a bed to sleep in. Upon waking up you will get a message indicating that you were visited and that you have contracted Porphyric Hemophilia. After three days sleep again and you will be a vampire. You cannot get this quest if you are already a vampire, as the "Dark Gift" topic will not appear. This quest must be started before The Purification quest has been finished, and should you wish to take Valtieri up on his offer, that must also be done before the end of the same quest. The quest can only be ended and removed from your active Journal list with the death of Valtieri. Even if you have 100% Resist Disease you will still get Porphyric Hemophilia. If the disease is cured (through the use of a Cure Disease potion/spell or an altar) before three days have passed, the quest will stay in your journal, and Vicente will not give you another chance. Therefore, it may be a good idea to just reactivate the bed and go back to sleep for the three days. After you become a vampire, you can ask Vicente about a cure for vampirism. If you become a vampire without receiving the Dark Gift and have asked Vicente about a cure for vampirism, the quest "Darkness Eternal" will appear even if the quest "Vampire Cure" has been initiated. 10 As a reward for my loyal service to the Dark Brotherhood, Vicente Valtieri is willing to turn me into a vampire. If this is my wish, I should speak to Valtieri about the Dark Gift. 20 I have accepted Vicente Valtieri's offer to turn me into a vampire. 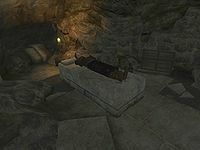 The next time I sleep in the Sanctuary, Valtieri will visit me and pass along his Dark Gift. 100 Upon awakening, I discovered two bleeding pinpricks on my neck. It would appear Vicente Valtieri did indeed visit me last night, and pass along his Dark Gift! If what Valtieri told me is true, my vampirism will begin to manifest itself in three days, after I sleep once more. 110 Vicente Valtieri believes there is a cure for vampirism. If I wish to investigate further, I should speak with Raminus Polus, a mage who has done some research into the subject. I can find him in the Imperial City, at the Arcane University. It is possible to use the console to advance through the quest by entering setstage DarkVamp stage, where stage is the number of the stage you wish to complete. It is not possible to un-complete (i.e. go back) quest stages. See SetStage for more information. Esta página foi modificada pela última vez à(s) 18h44min de 6 de fevereiro de 2014.